A homeopathic medicinal product used within the homeopathic tradition to relieve the symptoms of hayfever and other forms of allergic rhinitis. Always read the leaflet. What are Pollinosan Hayfever tablets? 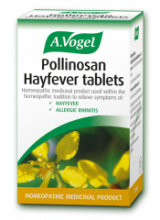 Click the button below to add the Pollinosan Hayfever 120 Tablets to your wish list.